Yup, I’m going to Disneyland! It all started with a bet of sorts at the beginning of the summer. I told my boyfriend that if I met my time goals in my 3 big races of the summer (Mt Evan Ascent, Pikes Peak Ascent and Denver Rock n’ Roll Half Marathon) he had to go to Disneyland with me. I then set what I figured would be achievable but tough time goals. Since I had never raced Evans or Pikes before I had to guess at what would be a good time goal. I chose sub 3 hours for Evans because that is the time women need to break to get a special trophy rock, which I really wanted! For Pikes I chose sub 4 hours, since rumor is most people take about an hour longer in that race compared to Evans and because that time would qualify me for wave 1 next year (technically sub 4:15 would do that but I wanted wiggle room!). I had more data to use for choosing my half marathon time goal, as I’d ran 5 in the past, although only trained seriously for 2 of them. My PR was 1:48:40 last January at the Tinkerbell Half Marathon, but I really wanted to be able to average an 8 min/mile or below for the race, so I set my goal as sub 1:45. In early October, with my Evans and Pikes goals under my belt, I started freaking out about the half marathon. Although the time goal had seemed possible when I set it, I’d spent most of the summer running up mountains and at altitude, running more like an 11 min/mile than an 8. Some unidentified foot pain and a cold set my training back a bit, and although I’d managed to do a few good speed and hill workouts, I really wasn’t sure if I was going to be able to break 1:45. The week before my race, I took my own blog advice and started focusing on Visualization and also worked on my Mental Toughness. I pictured myself on the course running a smooth and fast race, and told myself that this goal was possible but that to achieve it I needed to be willing to push myself to a place I have never been before. Basically, I prepared to hurt! I followed all of my usual sports nutrition strategies. I ate well and slightly upped my carbs for a few days. I hydrated. The morning of my race I had my typical pre-race breakfast: wheat toast with peanut butter, honey, and a banana (and coffee of course). Forty-five minutes before the race I drank a Generation UCAN, as I didn’t want to mess with needing a gel during such a short race but knew I’d be pretty glycogen depleted by the end. And then, I was off! My heel started hurting right away, but I ignored it and it went away. As the first few miles ticked by I realized that I was actually ahead of pace, running closer to a 7:30 min/mile. I was slightly concerned that I was going too fast and might burn out, so I slowed down a tad but made sure to stay ahead of pace. I grabbed a sip of water at the aid stations around miles 3 and 6. I felt awesome when I was able to get a hole in one with my water cup at the mile 6 aid station! Then, as I weaved around City Park, I got tired. The middle miles are the worst for me. I’m not close enough to the end to even think about just pushing it to the finish line, but I’m not at the beginning and feeling fresh either. 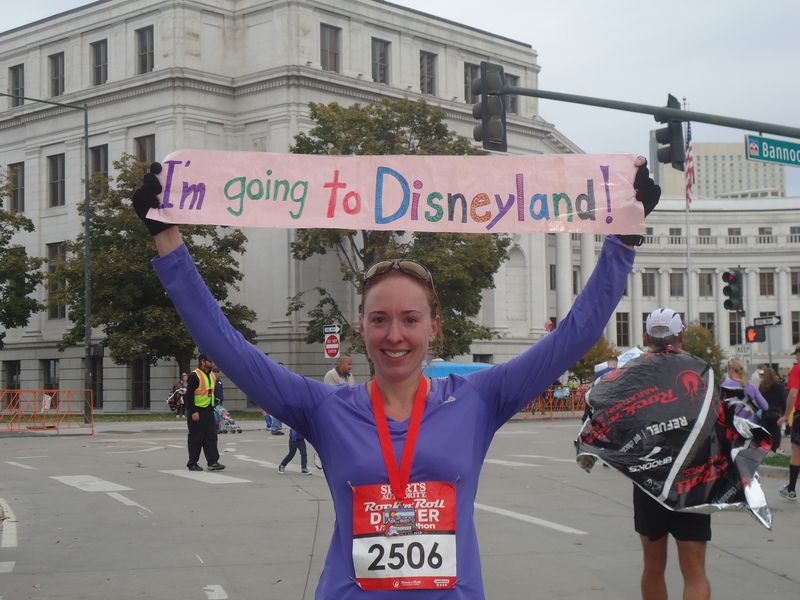 Luckily, my mom jumped out with the “I’m Going to Disneyland!” sign around mile 7 and I got a surge of energy, reminding myself that I had goals to meet! After slowing to get water at the mile 9 aid station, I had a hard time making my legs speed back up and realized it probably wasn’t a good idea to slow down and get water at any further aid stations, less I risk my legs failing me. The last 4 miles my legs started to hurt more but I was still on pace and so I pushed through. I sang some of my favorite running songs in my head. I pictured my running inspirations. I’d like to give a shout out to the woman in Cheeseman Park with the sign that read “Pain is temporary, but posting on Facebook is forever!” as it totally helped me push through the little hills of Cheeseman. I was in pain, but I really wanted to be able to post my success on Facebook. Lame? Maybe, but it got me through the last few miles! After exiting Cheeseman I knew I only had a mile left, so I kept reminding myself how easy a mile is to run. It’s just one mile! (You have to forget that you’ve just run 12 other miles when using this technique). As I rounded the corner to the final sprint I almost got teary. I was going to shatter my time goal! I had been seriously concerned I was not going to break 1:45 and now I was doing it. I crossed the finish line in 1:42:33. It felt awesome. Although I’d gone into the race saying I was going to retire from this flat fast running nonsense after this race, I left it wondering what else I could accomplish. Sub 1:40? Who knows what’s possible?! Looking back I realized that my altitude training had actually helped me in the half. I couldn’t believe how awesome my lungs felt the whole time, even when my legs were tiring. There was a time when running continuous sub 8 min miles would’ve left me gasping for breath, but after running at 14,000 feet all summer, the Mile High City air felt like it was 100% oxygen. I guess I stocked up on red blood cells over the summer! I know it’s opposite of the “live high, train low” philosophy but it worked for me. Besides recapping my race, I guess the message I wanted to convey with this blog is that we as humans are capable of so much more than we realize when it comes to athletics. We are able to hit our limits physically and mentally, and to somehow keep going. We are able to push ourselves to places we didn’t know we could go, but only if we are willing to challenge our minds and our bodies. Some people might be thinking “yeah sure it’s possible, but what’s the point?” To them I guess I would say you won’t know until you try!